I have been one of the most popular Los Angeles wedding officiants for many years. During that time I have officiated weddings of all kinds, including civil weddings and religious weddings, all over Los Angeles County and Orange County. Many of those weddings have been in Pacific Palisades wedding locations. Some of those weddings have been at Riviera Country Club, a wonderful Southern California wedding venue that you might consider for your wedding. Sitting in the Santa Monica Mountains in the quiet and beautiful town of Pacific Palisades, this lovely historic golf club will make your Los Angeles wedding an event to remember. The lush and flourishing grounds with stunning panoramic ocean views from the garden plateau and the historic clubhouse will help make your wedding ceremony and reception memorable. 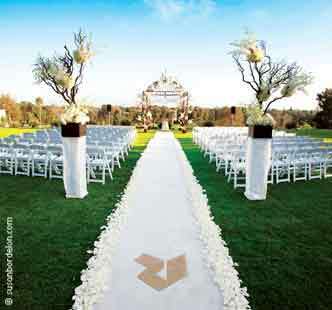 It is a very well respected wedding venue among Los Angeles wedding officiants. Three different wedding rooms are available in this breathtaking wedding venue. The Crystal Ballroom is surrounding by a large outdoor terrace and offers wonderful views of the golf course and the Pacific Ocean including Catalina Island. The Crystal Ballroom can host your celebration with as many as 240 guests. 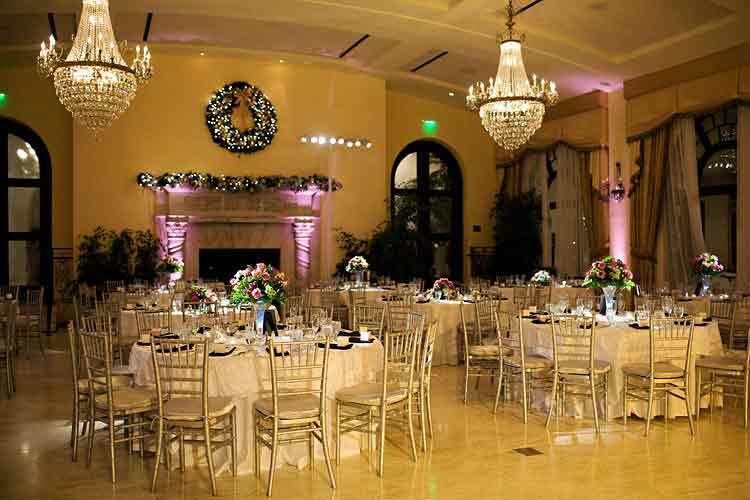 The Grand Ballroom is a historic Spanish-style venue accommodating up to 300 guests. This room offers high ceilings and wonderful views. But the most impressive wedding ceremony venue is the gorgeous Vista Riviera. Imagine a lovely gazebo with sweeping ocean views as a backdrop for your ceremony from this high bluff above the golf course. The stunning Vista Riviera permits as many as 500 guests for your ceremony and celebratory cocktails. No matter which particular venue you choose, you and your guests at the Riviera Country Club can stay in the 30 elegant and historic 1920 era guest rooms. The exceptional Riviera catering professionals will attend to your every need to make your reception an incredible dining experience. If you are planning your civil wedding ceremony or religious wedding ceremony and reception in Pacific Palisades or anywhere else in Los Angeles County or Orange County, consider the wonderful and historic Riviera County Club. And when you are choosing among the many Los Angeles wedding officiants, please consider this popular wedding officiant, the Officiant Guy, as your wedding minister.